Covering four decades, the Charlie Wilkinson collection is a fascinating insight into the development of packaging and design at M&S. 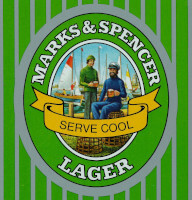 Charlie Wilkinson worked in the M&S Design Studio from 1954 to 1985 and was responsible for much of our iconic packaging from 1950s biscuits shown here, to designs printed on tin for our new range of beers in the early 1980s. Charlie started as a layout artist on our staff newsletter St Michael News, when it would take three days just to arrange the typeface and layout. Later he became responsible for cakes, toiletries and wine, making beautiful watercolour paintings for the labels. The collection, which has just been catalogued and photographed, includes these original paintings, mock-up designs and collages as well as packaging showing the finished product.